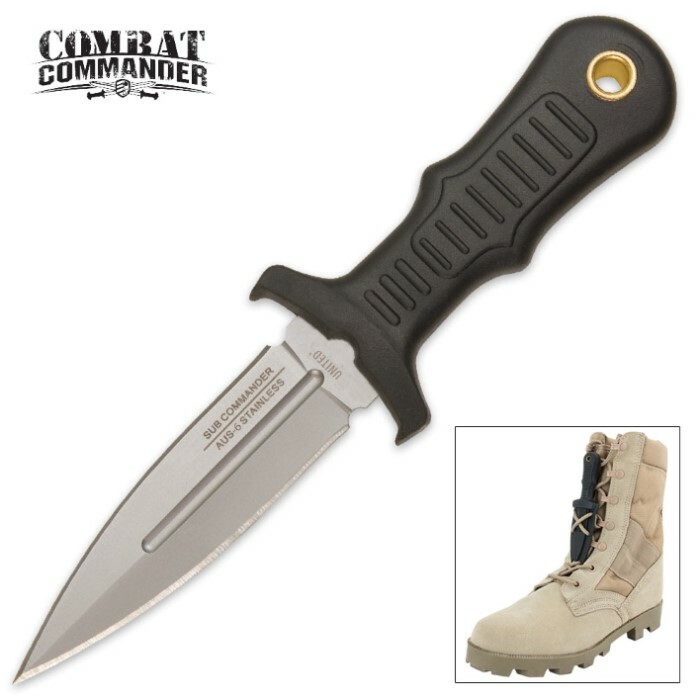 United Cutlery Sub Commander Silver Mini Boot Knife | BUDK.com - Knives & Swords At The Lowest Prices! The ultimate in concealed, compact self-defense; these Sub Commander mini boot knives hide discreetly within reach at all times. An injection-molded sheath with nylon lanyard ensures they are close at hand in case of attack. Bought two of these one for me and one for my wife. Will need a fine sharpening but would work as is. Was looking for a concealed knife to have anyplace I wanted one. May I first complain about the size of this knife. In the catalog it looks about half again the size it is. However it still manages to score five stars because is simply AWESOME! I take it work with me almost everyday. I use it multiple times a day, and let me say IT DOES NOT GET DULL. I haven't really really abused it yet,so for you guys who really beat up your weapons, I have no idea how well it will hold up. But if you just use as it's supposed to be used, it's great. It's small size makes it easy to conceal. One other complaint. Do NOT wear the neck sheath. On my first try, it fell out. It was so small I didn't notice, and I nearly hurt myself. So keep it in your pocket. Two more words. BUY IT! It was a little smaller than anticipated. Great little knife though. Very concealed. Worked great for the oh no, give me your knife times. Always with you. I really like this knife. It is exactly as advertised. Love the blade. (razor sharp), and the handle is amazing. Only downfall is the sheath. Described as a boot knife but arrived as a neck knife. Still great but the lock does not hold well around the neck. United Cutlery has always been a excellent choice for high-quality, low price knives. I have a large collection of knives and no less than 30 United Cutlery knives. I do not believe in torture-testing knives there really is no point as everything has a fail point. I use my knives, if they will not hold up to the stress, then I deem them useless or at best decorator items. This knife is well worth the money. I really do not see why people have a problem with the size of this knife. It clearly states in the description the overall and blade lengths. Any serious knife buyer should familiarize themselves with how long 5 inches is and how long 2 1/2 inches is. It is an easy to misjudge the dimensions if you are not familiar. This knife is small enough to be easily carried anywhere without getting in the way and large enough to do whatever it is called upon to do. I have two of the stainless and two of the black versions. It is definitely smaller than I had expected, but once I tied it into my boot and played around a bit I began to like it. I threw it into a wood block a few times and really began to feel like an epic action movie hero. I'd recommend it. They were serious about mini! I thought it would be a little bigger. However it is still a great, small, easily concealed, self defense weapon for the price. It fits perfectly on my boot. I knew this would be small but this thing is tiny. It is actually constructed well so I will give it some stars for that but it is just too small for anyone with normal sized hands. 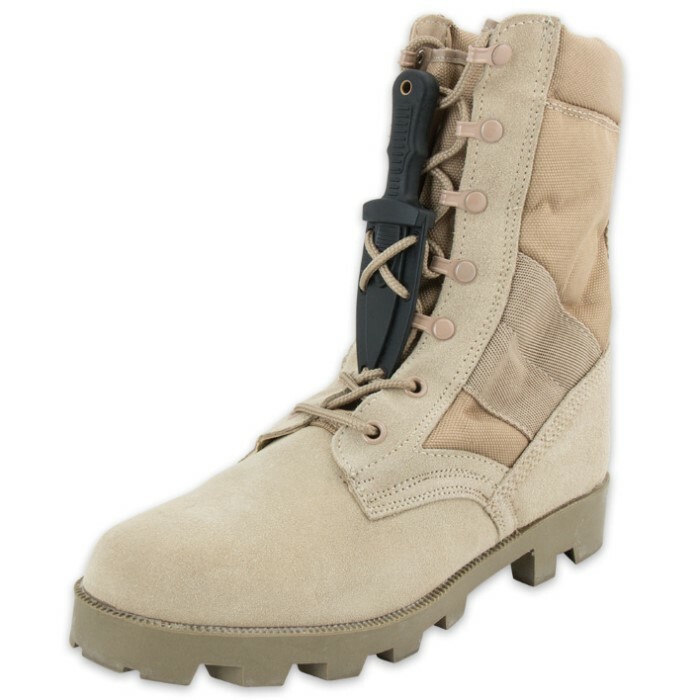 I would recommend getting a full size United Cutlery boot knife instead, which are all roughly around $15. For five or six more dollars you will get a knife that is much bigger and much more functional than this tiny thing.